Sarah Hentges, fitness instructor and Associate Professor of American Studies, and author of Women and Fitness in American Culture, can work with you to create a unique fitness experience for groups in a variety of settings. ~Academic workshops can be a traditional lecture or discussion, curriculum development, or can also include a kinesthetic component. ~Community workshops can include just a fitness activity or an activity plus a discussion. ~Fitness workshops can be designed for instructors or participants. There are many possibilities that can be tailored to your group and your needs. Here are some of the possible options…. Themes can be presented as lectures, discussion, or workshops or as a mixture of approaches. Fitness is a highly gendered pursuit where women are expected to get smaller and men are expected to get bigger. This talk examines the ways in which women have been betrayed by mainstream fitness and the ways in which mind/body and feminist fitness approaches can help to change our sexist assumptions about women's bodies and fitness. Fitness is rarely considered through its critical or creative aspects. How can we use fitness to better understand ourselves and the worlds around us? How can we use fitness to foster creativity? How can we make our fitness more creative? We often think about fitness as an obligation, as something that we have to do in order to meet aesthetic standards or health goals. This workshop focuses on the ways in which fitness is an act of self-care that is necessary to manage life's challenges. We'll consider how "functional" fitness can improve our lives personally and professionally, can create and foster community, and might even transform ourselves and our culture. Fitness is often conflated with sport and studied as a science. This workshop considers interdisciplinary approaches to fitness with a focus on humanities and arts approaches. Can include consultation on curriculum. How do we make our fitness feminist? This workshop offers a variety of feminist theories that can be used to make our personal fitness practice—or group fitness practice—more feminist. It covers the practical aspects of fitness instruction like cueing and choreography as well as the verbal, critical, and visual cues that instructors can use to make their classes dynamic as well as safe, welcoming spaces. Classes. One-time or a series. I teach a variety of group fitness classes that are similar to classes at community centers, university recreation centers, health clubs, and studios. I can bring them to you straight or with additional context. Yoga: beginner to intermediate; slow flow or fitness approach. Can include particular foci or themes or specialized playlists. Low to moderate intensity. Just Dance: A cardio dance class with choreographed routines, similar to Zumba and Group Groove. A mixture of music and dance styles. Moderate intensity. Belly Dancing: Head-to-Toe Introduction (basic movements, basic meanings, body awareness, (low intensity), Belly Dance Fitness, Cardio Belly Dancing. Moderate intensity. Organic Dance: A unique fitness-dance class that encourages participants to move as it feels good to them. A mix of choreography and free dance that combines mind/body techniques. Can include particular foci or themes. Low to High intensity. “Old School” Fitness: Step or Cardio Kickboxing or Interval or Muscle Conditioning or combo classes: original choreography taught in 32-count combos. Moderate to High Intensity. Retreats provide the opportunity to dig deeper into mind/body or feminist fitness and to experience a variety of fitness elements. Retreats allow us to relax, rejuvenate, practice self-care, make connections with others. Retreats can be designed as a half-day, day long, or two-day workshop tailored to the needs of the group: friends, coworkers, community members. We will work together to design a mixture of dance and/or yoga, discussion, activities in addition to what the host group/facility provides (like food, accommodations, even “luxury” items like massage or pedicures). Retreats can include themes or foci and any variety of fitness activities, discussion, and instruction. Organic Dance is a fitness program designed to connect the mind and body. This innovative fitness dance draws from a variety of popular styles of dance and fitness, adapting forms, methods, and patterns into a workout that encourages participants to move as it feels good to them. Organic denotes the ways in which the parts of something fit together to create a harmonious whole. Organic suggests something that is of the body or of the earth. Organic is characterized by continuous or natural development. Organic Dance is all of these things...and more. Bare feet are recommended but not required. No dance experience needed. A variety of themes and formats can be created for unique Organic Dance experiences. May, 2013: I offered an Organic Dance class to close our Interdisciplinary Student conference on the topic of food. The program for the conference features students' work as well as a description for the Organic Dance workshop. July, 2013: For the Bangor Pride Festival, I opened my Sunday Organic Dance class to the community. The theme of the Pride Festival was Keeping Up the Momentum and we were featured on the local/state news. October, 2013: I did a 45-minute class at the Caring Connections retreat. The theme "We Hope You Dance" meshed perfectly with the idea of Organic Dance. November, 2013: I presented an Organic Dance Workshop at the National Women's Studies Association annual conference. Here's a pdf of the pamphlet for: "Organic Dance, Fitness, and Self-Care as a Practice for Effecting Change." June 2014: For the Bangor Pride Festival, Organic Dance: Beyond Binaries. This special fitness dance class requires no dance skills, just the desire to celebrate Bangor Pride and explore the theme of "beyond binary" through movement and meditation. This class provides structure and freedom, inspiring music, and mind/body/spirit engagement. It's also a good workout! October 2014: "Girls' Night Out: Organic Dance" at Timberhill Athletic Club in Corvallis, Oregon. Spring 2016: Mind/Body Fitness Dance series on the UMA-Bangor campus. 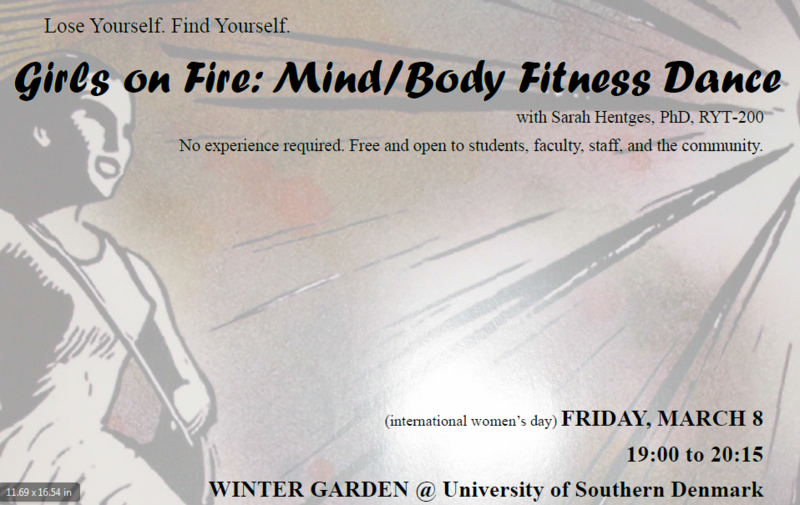 For more information, or to plan a fitness workshop with Sarah Hentges, please contact her at sarah.hentges@maine.edu. Sliding scale.